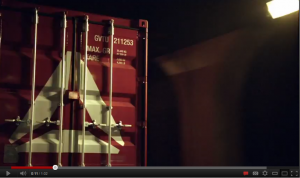 Some of GCVT’s 20 foot shipping containers can be seen in Reebok’s new television advertising campaign being shown in the UK and around the world. The shipping containers are shown being flown around the world dangling below helicopters and loaded on trucks in the campaign in which Reebok is committed to getting people to commit to fitness. The sporting goods brand has created a new campaign, The Sport of Fitness Has Arrived, that spotlights its partnership with CrossFit, a strength and conditioning program with a rabid cult following. At a recent event in New York City, Reebok unveiled a new TV spot from the campaign that will also include print, digital and event-based marketing such as a YouTube takover and events in select cities around the world that encourage consumers to try CrossFit. More than 400 Reebok employees a week complete CrossFit’s signature WOD (workout of the day) at Reebok’s facility in Canton, Massachusetts. Globally, nearly 1,000 Reebok employees practice CrossFit. As part of its partnership with CrossFit, which was inked last May, Reebok has become the title sponsor of the Reebok CrossFit Games, which crowns the fittest man and woman on earth, and a dual logo graces the CrossFit containers in which participants perform their workouts; some of which were supplied by Grand View Container Trading as seen in the TV advertisement. This entry was posted in Blog and tagged 20 foot shipping containers, GVCT, reebok crossfit containers, shipping containers.